The First ever Global Conference on Air Pollution and Health concluded at the World Health Organisation’s headquarters in Geneva, Switzerland. 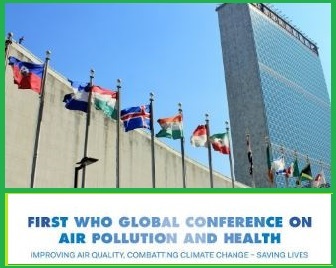 The Global Conference on Air Pollution and Health-2018, the theme was: “Improving Air Quality, Combatting Climate Change-Saving Lives”. The Global Conference on Air Pollution and Health-2018 aimed at eliminating one of the world’s most significant causes of premature death i.e Air Pollution. The Global Conference on Air Pollution and Health-2018 was a 3-day event organised held collaboration with: The UN Environment, World Meteorological Organization (WMO), The Secretariat of the UN Framework Convention on Climate Change (UNFCCC), The Climate and Clean Air Coalition to Reduce Short-Lived Climate Pollutants (CCAC) and The United Nations Economic Commission for Europe (UNECE). Air pollution exceeding recommended WHO Air Quality levels causing 7 million deaths annually. According to WHO, household air pollution is a leading killer in poor rural and urban homes. It is estimated that one-third of deaths from stroke, lung cancer, and heart disease are due to air pollution. Affordable strategies to reduce this include reducing key pollution emissions from the transport, energy, agriculture, waste and housing sectors. Also, Health-conscious strategies can reduce climate change and support Sustainable Development Goals for health, energy and cities.